Aldemar Weimaraners got its start in 1980 when Debbie & Al purchased their first weimaraner, Duchess. 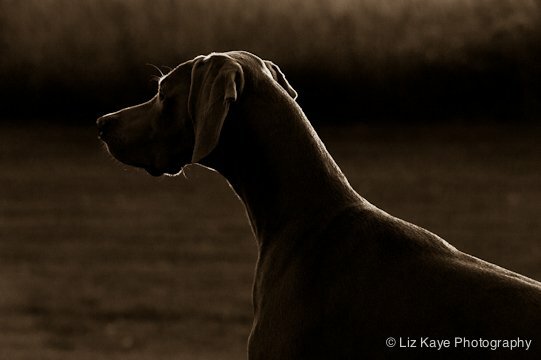 Although Debbie had owned a weimaraner previously, Duchess was the first weimaraner they purchased together. This wonderful dog provided much entertainment and started a commitment to the breed that has been ongoing. Through the years they have owned and bred a number of dogs, but Duchess was the dog that lay the foundation of love and devotion to the breed. Debbie and Al are members of the Weimaraner Club of America and breed according to the Code of Ethics. They do not breed often, and their philosophy is that if you cannot breed to better the breed, do not breed at all. Every litter that they have produced, was bred with the intention of keeping one for themselves. Although they have not kept a dog from every litter, they have kept or co-owned one from most of the litters. 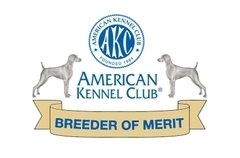 Keeping breed type in mind, all of their puppies are bred with health and temperament being the most important considerations. What good is a beautiful dog if you can't live with it or it is sick all the time? Aldemar Weimaraners are show dogs, but they are also pets. Their dogs, like our dogs, live in the house and sleep on the bed. At times it can be very crowded! All of their litters are whelped and raised in their living room, and their teenage daughter is given the opportunity to be involved and to help socialize the puppies. All of the Aldemar puppies are raised by the seven rule... By seven weeks they have been exposed to seven different age ranges of people and seven different surfaces. They feel that if a puppy is exposed to stress as a young dog it can better cope with stress as an adult. They also feel this is important in the overall health of the animal. Although we all love the breed, it is NOT the breed for everyone. The Weimaraner is an active dog that is very intelligent. If you are not smarter than the dog, the dog will own you as opposed to your owning the dog. A well exercised weimaraner is a tired weimaraner, and a tired weimaraner is a happy one. The more time you have to devote to the dog, the happier he will be. This is NOT a breed that does well when left on his own. They want to be with you, and many suffer from separation anxiety. The breed is loyal and loving. Most make good watch dogs, but are not aggressive. They will bark when someone comes to the door, but would probably prefer to bring their favorite toy to the intruder. They are intelligent, sensitive and loving. They are wonderful with children. Everyone that has owned or co-owned an Aldemar Weimaraner, can tell you that they certainly have found that they are a joy to live with.